PCOS stands for polycystic ovarian syndrome or polycystic ovary syndrome. It affects the ovaries and involves the female hormones which regulate the menstrual cycle, affect fertility and contribute to the sexual characteristics of women. Although ovarian cysts are usually present, hence the term polycystic ovary syndrome, many women with PCOS may not have any ovarian cysts. PCOS is often associated with infertility but this may not be a complication in every case of PCOS. Anovulation (no ovulation), however, is present in most cases. In addition, insulin resistance and impaired glucose tolerance is often seen in PCOS. The exact cause of PCOS is unknown but risk factors usually include a family history of PCOS and other menstual disturbance, diabetes and pituitary dysfunction. Obesity is another key factor. While these risk factors are common to many cases, the trigger for the biochemical disturbance and clinical features of PCOS is not known. The widely accepted mechanism behind PCOS is that the anterior pituitary gland secretes higher than normal amounts of LH (luteinizing hormone). This acts on the ovaries to stimulate the follicles to produce excess androgens. The high blood concentration of the androgens – testosterone, androstenedione, and dehydroepiandrosterone sulfate (DHEA-S) – affects ovulation. Low FSH (follicle-stimulating hormone) levels affects the way the ovaries deal with the androgens and this disrupts the levels of the female hormones like estrogen. This means that the ovary does not release an ovum (egg cell) as would be expected during the ovulation period prior to menstruation. This in turn results in persistent cysts. Cysts in the ovarian follicles are not present in every case of PCOS. It can be easily detected by a transvaginal ultrasound and is often used as a means of monitoring the condition. In PCOS there are multiple cysts which may vary between 0.5 to 1.5 centimeters (about 0.2 to 0.6 inches) in diameter. It is not uncommon for larger cysts to be present or a solitary massive cyst with numerous smaller cysts. Apart from the presence and size of cysts, the ovaries are usually enlarged as much as twice the normal size. The superficial ovarian cortex is thickened and may even undergo fibrosis, while the corpus lutea may be absent. It has to be noted that not every woman with PCOS will experience problems with period pain or issues relating to pregnancy. Similarly, ovarian cysts are not always present. Disturbances in the menstrual cycle, however, are present in almost every case of PCOS. PCOS occurs when there are high levels of androgens in the body, often as a result of an excess of LH (luteinizing hormone). An associated decrease in FSH (follicle-simulating hormone) affects the way the body deals with these androgens. The estrogen levels are subsequently reduced while the androgen levels are elevated. This affects the menstrual cycle and ovulation. These differences in the hormone levels will present with a host of features affecting multiple systems of the body. Impaired glucose tolerance or diabetes mellitus is often seen as a result of insulin resistance and these signs and symptoms may also be present. In younger girls, menarche (the onset of menstruation) may be delayed. This is known as primary amenorrhea. Girls or women who are menstruating may find that their menstruation ceases for 3 months or more. This is known as secondary amenorrhea. The periods may resume but the cycle is usually irregular and periods are infrequent (oligomenorrhea). It could be a very light bleed (scanty) or extremely heavy (menorrhagia). Excessive blood clots may also be present. Period pain (dysmenorrhea) is often reported in PCOS. Ovarian pain, a term attributed to lower lateral abdominal pain (pain on the sides) even without menstruation, may be persistent and exacerbates during ovulation (ovulatory pain) or during menstruation (period/menstrual pain). A common misconception is that severe pain during ovulation and/or periods is a normal occurrence. This often leads to young girls and women delaying in seeking medical treatment. While there may be discomfort, mild pain or slight cramping during menstruation, severe pain is not the norm and may be a sign of PCOS. The pain may be severe to the extent that it triggers nausea, vomiting, and even fainting (vasovagal reflex). Infertility is not present in every case of PCOS. However, persistent anovulation is frequently seen in PCOS despite menstruation. This is known as an anovulatory cycle. Ovulation does occur intermittently thereby allowing for pregnancy although it often takes longer to conceive. In a minority of cases, women with PCOS are infertile. Difficulty conceiving is a common reason for many women to seek medical treatment only to be diagnosed with PCOS. The other signs or symptoms of PCOS may be absent, minor or ignored despite being blatantly obvious to the patient. Oligomenorrhea – infrequent irregular periods, often heavy when it does occur although it may be scanty (very light). Amenorrhea – the complete absence or cessation of periods for 3 or more months. At least 2 of the 3 criteria (menstrual disturbances, ovarian features and/or androgen excess) below should be present in order to diagnose polycystic ovary syndrome. In addition, other conditions need to be excluded, including pregnancy, hypothyroidism, Cushing’s syndrome, tumors (ovary, uterus), and the use of certain drugs that are known to cause these clinical features. It is important to note that the presence of cysts or infertility is not present in every case of PCOS. Oligomenorrhea or amenorrhea which may indicate oligo-ovulation (infrequent) or anovulation (no ovulation). 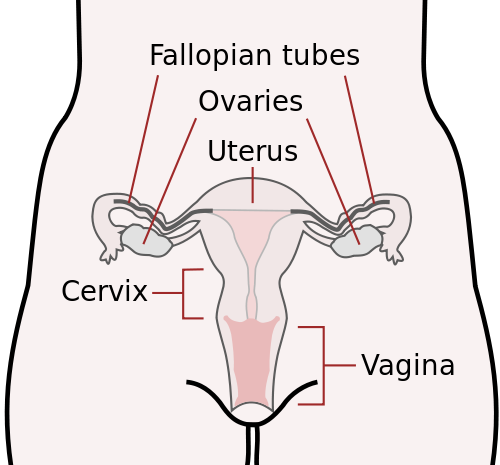 Enlargement of the ovary resulting in a total ovarian volume > 10 cm3. Other biochemical investigations are discussed under PCOS Blood Tests. Treatment of poylcystic ovarian/ovary syndrome (PCOS) depends on the clinical features present and whether pregnancy is desired. Diet and exercise are essential components of PCOS treatment and management, especially in obese patients and those with diabetes mellitus. Prevent and manage complications associated with PCOS. Treatment also helps to reduce the severity and extent of other PCOS symptoms and clinical features such as hirsutism. Metformin is an antidiabetic medication which is used for insulin resistance and reducing the blood glucose levels. It improves glucose tolerance and assists with reducing the elevated blood insulin levels (hyperinsulinemia). Metformin also helps with improving the ovulation rate in many cases of PCOS, especially when used with clomiphene citrate. Patients on metformin may also find moderate weight loss, which is helpful in women who are overweight or obese, but it should not be solely used for weight management. Thiazolidinediones are another type of diabetes medication that may be used but it is not suitable if pregnancy is desired. Oral contraceptives (combination – estrogen + progesterone) may help with regulating the menstrual cycle by the secretion of LH (luteinizing hormone) and FSH (follicle-stimulating hormone). This decreases androgen production by the ovaries. It is used in women with PCOS who do not wish to fall pregnant. Oral contraceptives may be used for periods of time before being discontinued in an attempt to stabilize the cycle. Clomiphene citrate stimulates ovulation by decreasing the negative feedback mechanism of estrogen on FSH (follicle stimulating hormone). It is widely used for the treatment of infertility as a result of anovulation. Concurrent use of metformin may significantly increase ovulatory cycles thereby increasing the chances of pregnancy. Other medication for the treatment of hypertension and hyperlipidemia may be considered if these conditions are present in a woman with PCOS. There are two surgical procedures used in the treatment of polycystic ovarian syndrome. Surgery is considered when medical treatment (medication) fails to achieve the desired results. Abnormally large cysts may prompt surgery sooner. The preferred method is laparoscopic surgery, also known as laparoscopic ovarian drilling. Various methods, including electrocautery, laser drilling or multiple biopsy, are used to create focal areas of damage on the thickened ovarian capsule. The other surgical method which is not as widely used these days is ovarian wedge resection. Here a portion of the ovarian tissue is removed and the ovary sutured. The chances of complications like hemorrhage and adhesions are greater than with laparoscopic drilling. A less common complication is ovarian atrophy. Dietary changes and exercise should not be discontinued after surgery. Dietary management should be adopted in conjunction with medication and exercise for the maximum benefit. Ideally a patient with polycystic ovarian syndrome should consult with a dietitian who is working in conjunction with their gynecologist and endocrinologist. The average adult female requires approximately 2,000 calories per day to maintain a normal body weight. This may vary depending on height and level of activity. A calorie-restricted diet may vary between 1,500 to 1,800 calories per day for an overweight or obese patient and rarely a diet of 1,200 calories per day is adopted. Any diet that is less than 1,000 to 1,200 calories may be detrimental to a person’s health, lead to nutrient deficiencies and further exacerbate anovulation and amenorrhea. Calorie-reduction is often the better approach. By teaching a PCOS patient to remove anywhere between 500 to 1,000 calories per day, a patient can gradually adapt to the eating plan. This increases the chances of compliance and allows the patient to learn and practice proper dietary management. The goal of any calorie-reduction or restriction is to reduce the body weight and ultimately improve glucose tolerance. Exercise is a key factor in any plan. Glycemic index or GI is the measure of the extent certain foods, mainly carbohydrates, raise the blood glucose levels. High GI foods contribute to weight gain and poor glucose control. The modern diet is laden with high GI foods primarily derived from refined carbohydrates and other starches. Eating low GI foods essentially improves glucose tolerance by reducing the ‘spikes’ in post-prandial glucose levels (after eating) and controlling the secretion of insulin in response to elevated blood glucose levels. This is an essential component in the dietary management of impaired glucose tolerance and diabetes mellitus. White, brown and wholewheat breads have a high glycemic index. Rye bread, whole grain and breads marked as low GI are preferable. Most pastas are high GI foods unless otherwise stated. Pasta made with durum wheat is preferable. Rice is a low GI food, especially variants like basmati rice. However, calorie content has to be carefully monitored as 1 cup of cooked rice could exceed 200 calories. Pineapple, mango and dried fruits like raisins should be eaten in moderation. Watermelon should be avoided. Parsnips, pumpkins, potato and carrots should be eaten in moderation or avoided. * Please note that there may be certain variations with the list above based on preparation methods, plant species, ingredients and combination with other low GI foods. Always consult with a registered dietitian. Ideally a PCOS eating plan should include moderate amounts of mono- and polyunsaturated fats. Saturated fats and trans fats should be excluded from the diet. Refined carbohydrates may contribute to elevated triglyceride levels and low HDL-C (HDL cholesterol or the “good cholesterol”).